Yes…I am The Tupperware Queen.More about that in a minute. What happens to that second sock once it is thrown into the dryer? But it’s not only socks that go missing. Many common household items have a way of disappearing into the abyss. In my family, I’m known as the “Tupperware Queen” aka “keeper of the Tupperware”. I have a drawer devoted to my Tupperware. I own just about every conceivable size and shape of Tupperware. They all get used from time-to-time. They all have a purpose. They really do. But…my family is not convinced. I get teased regularly about my obsession with my Tupperware collection. That’s probably because I’m always on their case if they don’t bring me back my Tupperware if I’ve allowed them to leave with it. Pity the poor fool who doesn’t return my Tupperware! Tell me, I can’t be the only one that worries about their Tupperware, can I? What gets me more than losing a whole Tupperware container (because that actually makes sense), is when I discover I have the container…but not matching lid! How does that even happen? When someone takes the lid off a container, where does that lid go? In the garbage? Are there people out there I don’t know about who secretly collect Tupperware lids? The mystery of the disappearing Tupperware lids has plagued me for years! When I complain about my disappearing Tupperware I get told to just go buy more. But that just reminds me of another item further down on my list…disappearing money! So the other day, after putting away washed Tupperware and doing a load of laundry, I discovered I was missing a sock from a pair of socks I had just washed. Or so I thought it was a pair of socks I had put into the dryer. Upon opening the dryer door, the matching sock was nowhere to be found. Not in the freshly washed laundry, and not in the hamper with the remaining dirty clothes. I even checked to make sure I didn’t drop the sock somewhere along the path between the washer and my bed. Logically I also checked through my sock drawer. My sock had simply vanished. Was my sock part of a conspiracy theory? Some would believe it was. The more likely culprit was one of the two furry beasts who live with me, however, a search of their play area and bed failed to turn up any evidence of my sock. So it appears that my sock boldy went where many of my socks have gone before…deep into the mouth of the wicked Dryer Monster. This is the only thing I can conclude about the fate of my sock. When thinking about disappearing Tupperware and socks the other day, I started contemplating about all the other items that seem to go missing around here. 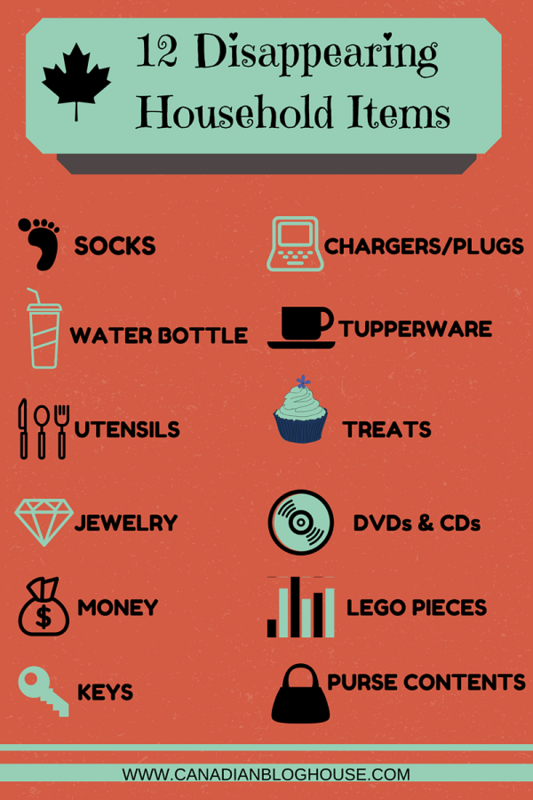 How many of these disappearing items sound familiar to you? I’ve come to the conclusion that I will never solve the mystery of the disappearing sock or Tupperware lids. As for my disappearing purse contents, I’m not even going to try to figure that one out! What household items regularly go missing in your house? Missing Tupperware lids DRIVE ME CRAZY! I don’t blame you one bit. Also? If you invest in good Tupperware, you definitely want it back from whomever borrowed it! For me, in addition to the lids, are hair elastics. Buy a brand new batch and they’ve disappeared by the end of the week! Yay!! Lol!! I’m in great company! Glad you feel the same way I do, Julie! Ooooh! YES! Hair elastics! That’s a good one! I am forever losing those too. Just like the socks…they are never to be found again! Thanks for stopping by Julie! It’s not just water bottles that go missing in my house. It’s usually the lid, or the bottle, or a straw. I will search everywhere and if I don’t find it – I toss the piece I do have. Naturally I find the other piece the next day or something. Yes! Water bottles are on my list…but those straws! They are bad too! lol Oh yes…throw a piece out..and the next day you will find the other piece you were missing – that’s a given! 🙂 Thanks for stopping by Randa! GRR!!! I hate missing things! (great list by the way!). My biggest pet peeve is missing tupperware lids! Socks I can forgive (many times, my kids have the lost one in their room! ), but tupperware!! WHAT!! Thanks Jenn! My thoughts exactly…WHAT?!! lol Hmmm…never thought…some of those missing socks may be under dressers and beds 🙂 Thanks for stopping by!! I literally laughed out loud when reading your comment, Kim! Your bra?! I have to say…that is one item I have never lost…except on purpose, lol 😉 Thanks for stopping by! Funny…treats disappear all the time around here. I have to admit though…it’s often me making them disappear 😉 Thanks for stopping by! Ha! These are definitely commonly lost items in our house too! and I too have an entire cupboard devoted to Tupperware (ok, so it’s not exactly Tupperware branded, but you get the idea).. I’m a hoarder! (also, not exactly true) lol. Hehehe! Glad to hear you have a whole cupboard devoted to “Tupperware” Orangeheromama! Thanks for stopping by! These lids of ours must be “organized” ’cause too many of them disappear for me too! What is WITH that?? lol! Otherwise, for us its mostly pens that disappear on a near daily basis. Doesn’t matter how many containers we leave around the house to store these little gems, they go missing the VERY moment you need one. Doh.